...and here I am finally! The weather has been mostly beautiful this past few weeks and I've been taking advantage of it by working on the garden downstairs. Everything growing on the balcony is going full blast now and demanding a lot of attention with watering, pruning, staking, moving, etc. 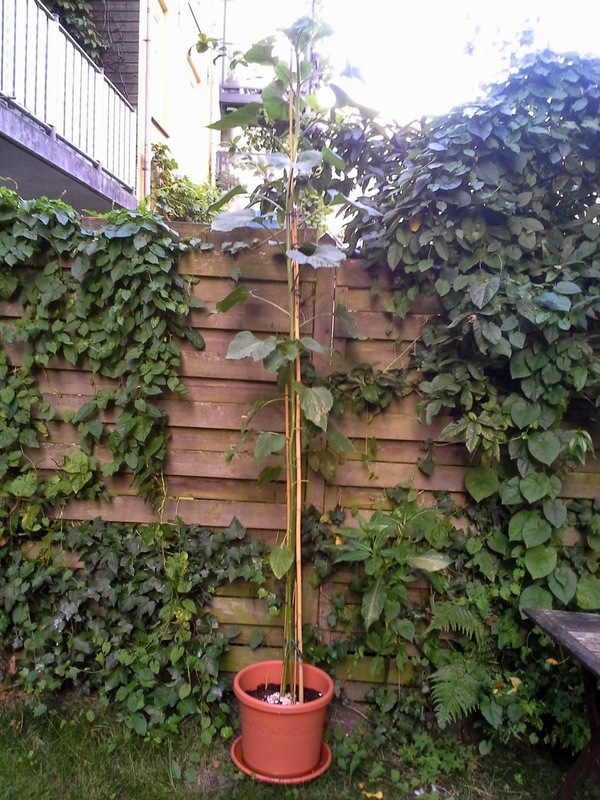 Yesterday I had to have an emergency re-homing (with the help of my upstairs neighbour, Luigi) of this monster that grew way too large for the balcony and was way over two meters tall. It's now enjoying the great outdoors of the garden and can reach it's full potential. I need to read the seed packet next time for maximum heights next time! My little flower patch in the garden is coming along quite well. Things are growing and flowering and generally settling into their new environment. I'm particularly proud of the nasturtiums growing in there from seed. I must take a better photo of them. This one is a few days old and they've leapt up a few inches more since then. The forks continue to keep the cats of it this area. The red spots on the ground surrounding the flower patch is my own mix of cayenne pepper, cinnamon and garlic which keeps the cats from crapping there,too. It's about 2 meters tall and densely full of a lot of everything all tangled together. You can't even get through there so I will have to hack my way through. Theo tried to get in there last week and couldn't when he locked himself out again and thought he could walk through our side into his back door. I have my work cut out for me! I just keep planning and dreaming of garden fresh veggies for me! Plus I love planting seeds and watching, tending and loving what grows from them. My next post (hopefully tomorrow) will be about some of the other things I've been doing and making over the past several weeks. I hope you'll drop in and let me share this with you.